Today Joel and I tried to explore as much of London as we could before we needed to catch or train back to Paris. We took the tube to the Westminster stop which has very interesting architecture. It's very modern looking with concrete and pipes. It reminds me of something from science fiction like the inner workings of the city in Logan's Run. 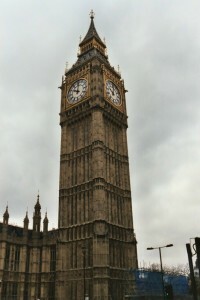 When we stepped out of the station there was a good view of Big Ben and of the London Eye. 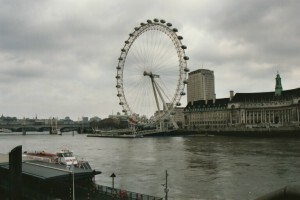 (At £10.50 a person we decided to skip the London Eye.) 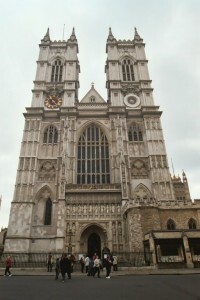 We then walked over to Westminster Abbey. Since it was Sunday there were no tours of the abbey, so we just walked around a bit and made our own tour. 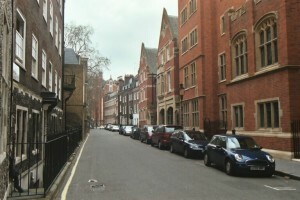 The streets around the abbey were interesting with all of the buildings squished against each other. 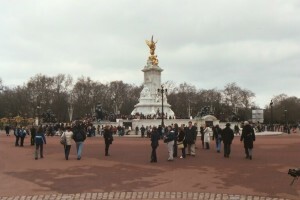 We then walked over to Buckingham Palace where there was a large crowed of people gathered. With this many people gathered I thought the Queen was going to make an appearance. It turned out they were just waiting for the changing of the guard. I was very disappointed and couldn't believe that many people would show up for the changing of the guard. From Buckingham Palace we walked over to Hyde Park and took the Tube to the Science Museum. Joel's guide book didn't have many positive things to say about this museum. It was wrong. I'm glad Joel convinced me to go because it turned out to be a great experience. We started off with an exhibit named "Who am I?" Joel and I spent a great deal of time here as this exhibit was very well done and very interesting. It covered everything you can think of about who we are such as appearance, intelligence, inheritance, genetics, language, and emotions. I found it even more informative than all the shows on The Learning Channel on the subject (produced with the BBC.) We even played an interesting game of life that was cleverly designed using a round white table with several dials and a projector attached to a computer. After playing a few rounds of the game we went to the IMAX Cinema and watched Space Station 3D about the International Space Station which was very interesting. It's the first 3D IMAX movie to be filmed in space. After coming down to earth we spent a little more time exploring the museum, but there was so much to see and so little time. Looking at the map of the museum I'd say we only saw about 5% of the museum. It's too bad we didn't have more time because there was so much more I would have liked to see. From the museum we went back to the Hotel to pick up our luggage, stopped at the convenience store to pick up some food for diner, and then strait to the train station to take the Eurostar back to Paris.